Aero Tech Designs wants all riders to be safe while riding. All have heard of cyclists who have been hit or have lost their lives because they were not seen on the road. 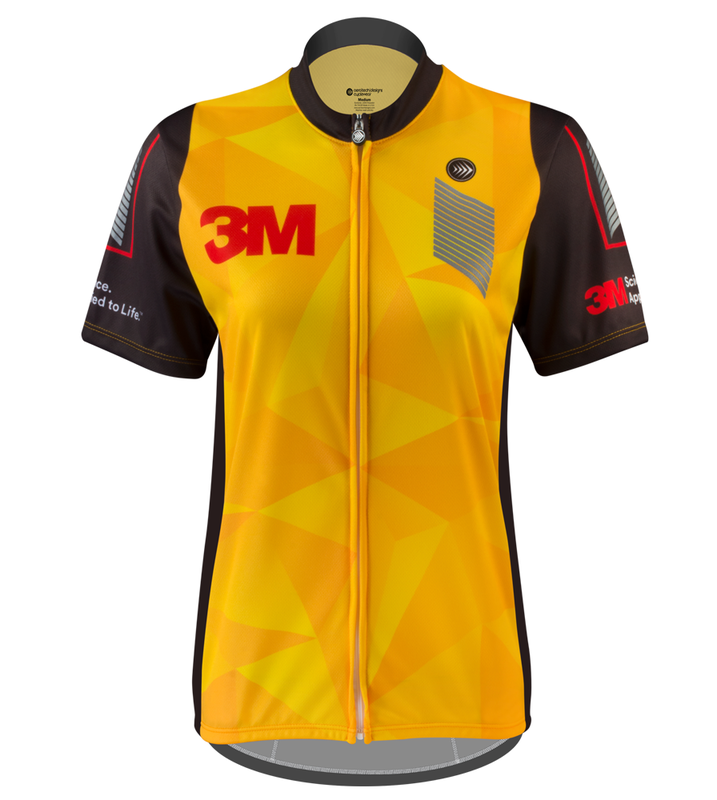 Aero Tech Designs is partnering with 3M to promote safety while riding with our Safety Initiative Program (S.I.P.). SIP or Safety Initiative Program is aimed at outfitting and educating cyclists to ensure safety on the road. Customer safety is very important to us and being an industry leader in providing quality cycling apparel, we have a responsibility to provide information for a safer ride. 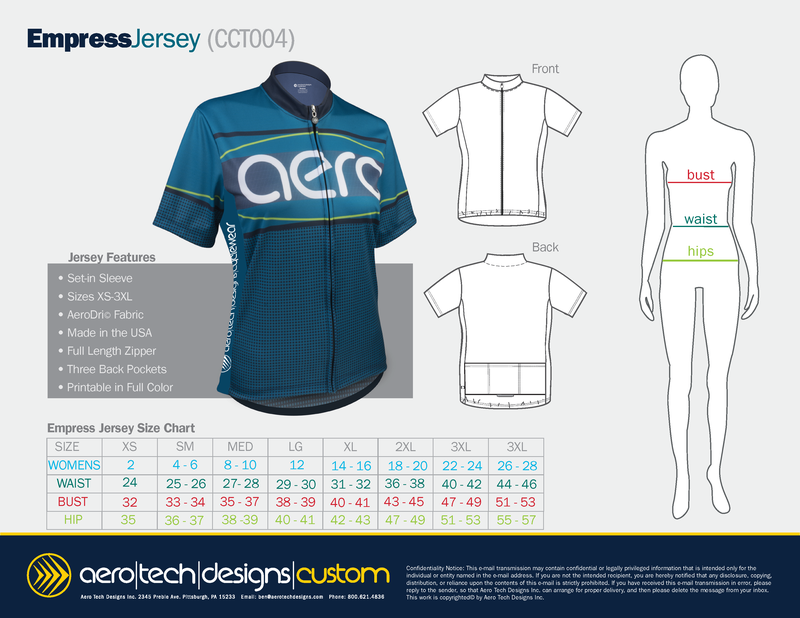 Aero Tech Designs Women's Empress Jersey. You will feel like a goddess wearing our women's cycling jerseys because that they are made specifically for the female cyclist. The cut is contoured to a women's shape and needs. Designed to look flattering on and off the bike. Constructed from moisture wicking polyester, the fabric is a luxury soft wicking polyester micro-mesh that is engineered to transport moisture away from the body and into the outer layer of the fabric for evaporation. If you are a woman cyclist and you love comfort and performance you will love the Custom Printed Woman's Empress Cycling Jersey! Women's Empress Cycling Jersey with full zipper front and sleek hemmed sleeves, designed to work for the competitive team or the weekend club ride, the women's empress jersey is crafted from soft and rugged, 100% WickAway polyester; perfect for the wicking sweat away and keeping cool on hot days. 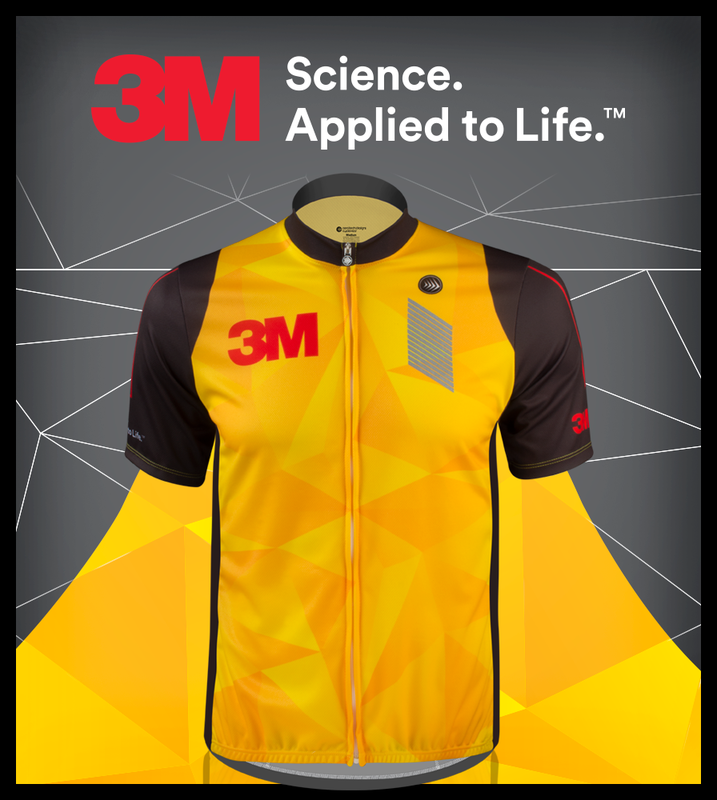 3M Reflective tab on the middle pocket adds value for visibility in low light conditions. 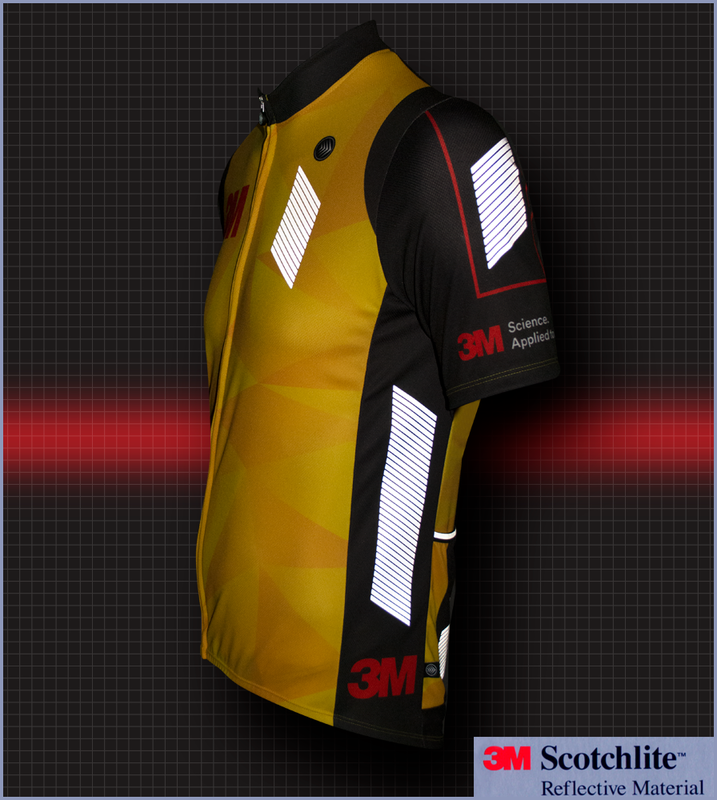 3M reflective is known worldwide as best in class and will aid in visibility. Three generously sized rear pockets are designed for easy access, but tight enough to keep water bottles and nutrition bars inside safely. Pockets are reinforced for long life. The hem is slightly elastic to hold the garment snug to hips to keep it in place and prevent flapping in the wind. The neckline has a sublimated, tagless label that eliminates skin abrasions and irritation from inside the garment. Frontal full length zipper with an Aero Tech Designs pull tab is standard on all the jersey. Choose your route before the ride. Wear a helmet and use bike lights. What exactly is 360° Enhanced Visibility? Well, it is the latest design approach developed by 3M to help athletes be seen in night time and low light conditions from nearly every position or 360°. 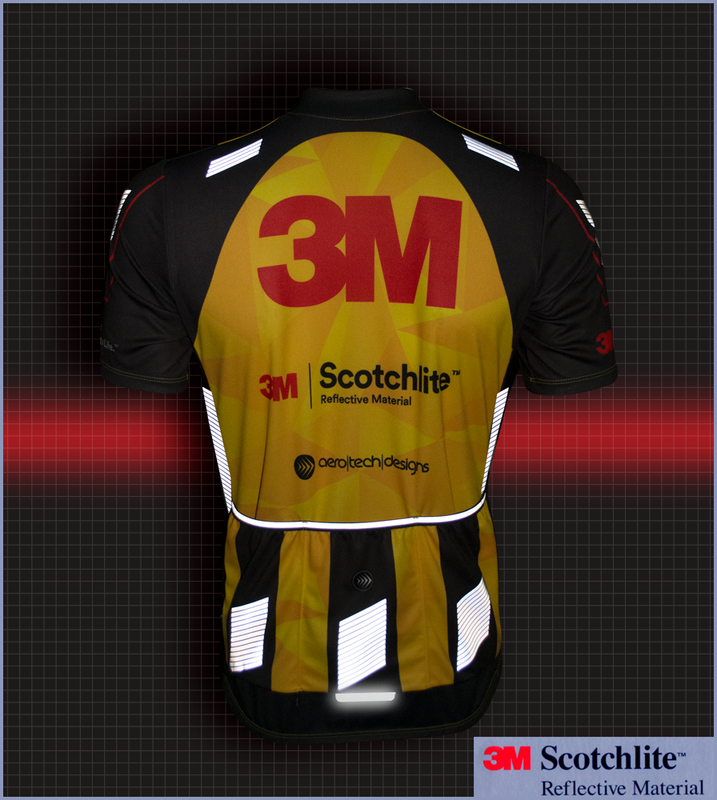 The 3M Scotchlight material provides increased visibility because it requires that the 3M Scotchlite Reflective Material be visible on all sides of the garment in specific areas. This is extremely important because each year, nearly athletes are killed in traffic crashes. Of the total accidents, 65 percent of pedestrian fatalities occur between 6:00 p.m. and 6:00 a.m. Factory Direct Value - Made in U.S.A.
Love the bright colors on this jersey. There is plenty of reflective material so that motorist will see you on the road. Very nice jersey. Fits as expected and the reflective materials can be seen from every direction. The fit is very baggy in the body, even with a women's XS. Only purchased because it's my company, but knew from fit kit that it wouldn't be a great fit. Would be nice to have race fit or more true to size XS club fit offered.